Susanna and I were laying in the bed when we suddenly heard the sound of complete satisfaction. 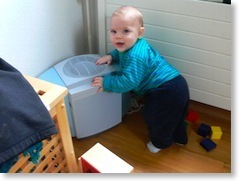 He had stood up and was holding on the humidifier. How did he get there? We don’t know! I’m still trying to get over the fact that oranges are pre-sliced by nature.